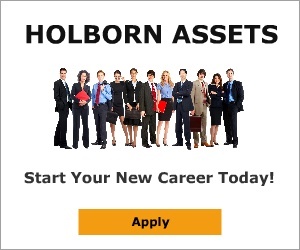 Next review Keren Bobker: Holborn Assets. Nov 10, 2015 We pride ourselves on offering the very best training and support in the business. We promote from within meaning that dedicated people get the chance to reach the very top. Unfortunately in our business, you won’t progress very far if you just let it be, you may even have to work a hard day’s night, but the rewards and opportunities are endless. Holborn Assets - Dubai based 'financial advisory' service is at best amateur, hiring 'independent financial advisors' with little or no experience in their fields and are incentivised to to sell investment products against ridiculously high targets. Seemingly the 'Christian' run firm had been missing targets in 2014, hence setting its commission based staff super high targets - if met consultants were in for a chance of winning flights and tickets to the World Cup Finals in Brazil - all well and good if the IFAs don't brag and broadcast this information across social media channels and mention it to their clients. Surely financial advice should be about giving the best possible to support to your client - not flogging products to anyone that will buy them in the hope of a trip to Brazil! Review #496835 is a subjective opinion of User496835.